Carrot Cupcakes all dressed for Easter! This is a great recipe for moist, delicious, carrot cupcakes, so give this recipe a try even if you're not interested in bunnies. 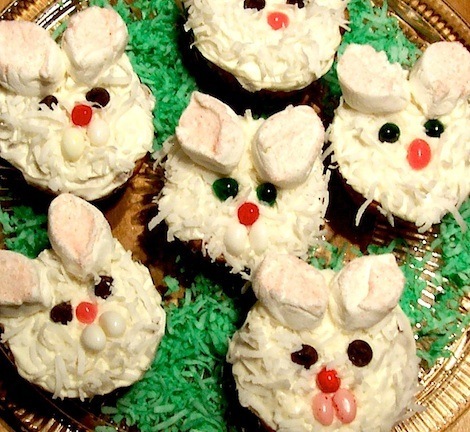 They taste great with or without the wonderful cream cheese icing, but they sure are cute when made into Bunny Cupcakes. Enjoy! 1. Line 12-cup muffin pan with cupcake liners. 2. In a large bowl, stir together flour, sugar, baking powder, cinnamon and salt. 3. In another bowl, combine carrot, oil, yogurt, extracts and eggs. 4. Add the wet ingredients to the flour mixture and mix until just blended. 5. Fill cupcake liners to about ¾ full. 6. Bake for about 20 minutes at 375ºF or until firm and baked through. Toothpick should come out clean when inserted into the center. 1. In a mixer bowl, beat together cream cheese and butter until smooth and light. Add vanilla and mix some more. 2. Add sugar and continue beating until light and fluffy. Add a little water if necessary. 3. Spread on carrot cupcakes. Je les trouve craquant, bravo.